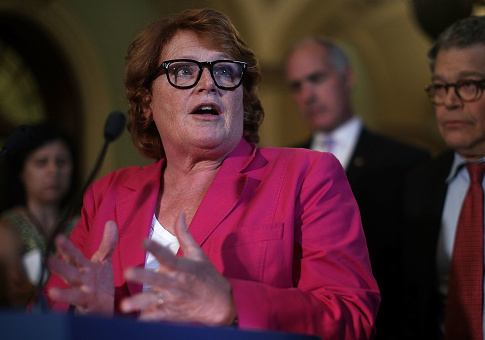 The Senate Leadership Fund, a Republican political action committee, launched a new website on Wednesday highlighting what it calls Democratic Sen. Heidi Heitkamp's (N.D.) "record of hypocrisy." In October, the senator said "somebody should go to jail" over a Wells Fargo account fraud scandal. Her comment came nine days after she accepted $1,000 from the company's political action committee. The website shows Heitkamp in front of a "Wheel of Fortune" gameshow word puzzle that says, "Record of Hypocrisy." The new website outlined how the senator has routinely denounced Wells Fargo in public while accepting thousands of dollars in campaign contributions from the company's PAC. On October 4, 2017 Heidi Heitkamp went on CNBC to say "somebody should go to jail" over the Wells Fargo account scandal. The catch? Nine days before she publicly denounced Wells Fargo for their lack of accountability, she quietly accepted a check for $1,000.00 from their Political Action Committee! She has consistently attacked Wells Fargo in public while taking their cash in private. On September 20, 2016 she published a video on Youtube called ‘Heitkamp Holds Wells Fargo Accountable'. The video, published on an official government account, failed to mention that she has has received $15,000.00 from Wells Fargo's Political Action Committee in the form of campaign contributions, including $3,500.00 since the scandal became public. Heitkamp also wrote an op-ed about holding Wells Fargo accoutable in the Grand Forks Herald in late September 2016. The senator promised to "keep working to get answers and accountability" and cleaning "up its act by restoring the safe environment employees need and North Dakota customers deserve." Heitkamp declared in September she was running for reelection in 2018, and she faces a tough climate as a Democrat after President Donald Trump defeated Hillary Clinton in North Dakota by 35 points last November. The Washington Post has the state's race in its list of "top 10 Senate races" of 2018. The Republican-aligned group is also targeting Democratic Sens. Joe Manchin (W.Va.), Claire McCaskill (Mo. ), Joe Donnelly (Ind. ), and several other Democratic senators. This entry was posted in Politics and tagged CNBC, Donald Trump, Fraud, Heidi Heitkamp, Hillary Clinton, Republicans. Bookmark the permalink.